Challenge: How to increase staff attendance in annual CPR-training courses at Södersjukhuset? Concept: A CPR game for health care professionals with the aim to save a patient’s life within five minutes through a combination of physically performing CPR and using efficient communication and team collaboration. The subnational cardiopulmonary resuscitation (CPR) guidelines state that it is mandatory for every health care employee to update their CPR skills annually. Thus, Swedish hospitals arrange CPR courses for their employees. However, hospitals seem to have difficulties in achieving high attendance rate for this training course. 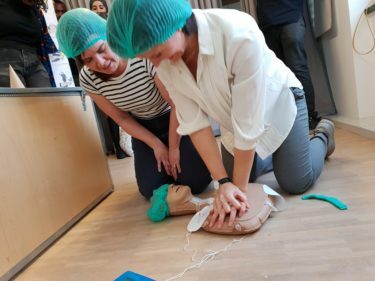 The challenge purposed by Stockholm County Council was to increase the annual CPR course attendance rates at Södersjukhuset. By following the Design Thinking Process, the final concept to solve this versatile and complex challenge was Revival – the game, a CPR game for health care professionals. The aim of the game is for healthcare professionals to save a patient’s life within five minutes, through a combination of physically performing CPR, but also through efficient communication and team collaboration.The game constitute visual reminders of the importance of CPR, as well as enabeling staff to update CPR skills on their own terms. The game banks on the subnational guidelines articulation that frequent low-dose reminders are the key for successfully saving lives through CPR.